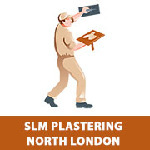 SLM Plastering are plasterers based in Harrow and serve North London and West London. We cover all aspects of interior plastering for both residential and commercial properties in North London, Hertfordshire, Essex and surrounding areas including Watford, Uxbridge, St Albans, Hatfield, Slough, Wembley, Luton and London City. We mostly work with contractors on housing and office plastering projects all over London, but also work with homeowners, landlords and small business owners who require a professional and experienced plastering service all over London & surrounding areas. With over 40 years experience, we complete the job from start to finish and will ensure you are 100% satisfied with the work completed. Call Us Today on 07970 193 553.